On Monday, April 8th, Hotel Oakland Village was excited to welcome Dr. Thomas Cudjoe, an MD from Johns Hopkins. 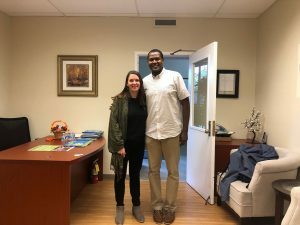 Dr. Cudjoe is doing a research project about the social connections of older adults who live in low-income housing. He would like to better understand what factors may facilitate or are barriers to social connections. The Hotel Oakland Village is a great example of fighting senior isolation and “Participating” in your health and wellness. Dr. Cudjoe found our model to be very “innovative!” and he thinks we could be a model community for others to follow. As always, we are happy to share our story with others and look forward to collaborating with Dr. Cudjoe. ← HUD researchers visit Hotel Oakland Village!